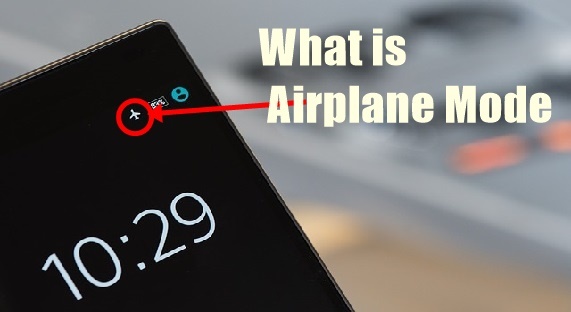 What is Airplane Mode and What is the Use of it: Mobile has different types of options, one of them is Flight mode or Airplane mode but many users do not know what Airplane mode is? Why is the flight mode in mobile and what is the use of it actually? The people who use the smartphone, they have the information that the phone has flight mode and sometimes they use it, but they are unaware of whom it has been executed exclusively. Flight mode, offline mode etc. to Airplane Mode Also known by many other names. Flight mode is a feature of mobile which allows transmission signal to be turned off in mobile when on-turn. Closing the transmission signal means that the call will stop going on in the mobile and the Bluetooth, WiFi, etc. will stop the sensors. It was designed to prevent mobile connectivity in flight/airplanes. If you've ever traveled air, it must be heard that the takeoff and flight of the flight are called to put the mobile phone in flight mode as there is a significant role of signals in the takeoff and landing of the flight. Airplane travel is determined according to the instructions sent by its electronic system and air traffic control. When connectivity is turned on in mobile, it tries to communicate with the network, due to which the air signals of the flight can be interrupted, which can guide the flight takeoff and landings to the flight and cause flight crashes. Now you may have understood that the mobile flight does not have any barrier or obstruction in the signal during landing and flight, hence the flight mode on the mobile is said to turn on, so that the cellular network, Bluetooth, WiFi are closed in mobile and This does not cause any hindrance in flight signals. As you have learned, its main use is during air travel so that there is no resistance in the flow of traffic between the signal and its system. Mobile mode is quickly charged when the flight mode is turned on in the mobile phone i.e. we can use it to charge the phone fast. Even though the airplane mode is turned on, we can use the Internet in mobile and that is through Wi-Fi. However, on the airplane mode on mobile all sensors can be switched off but on the flight mode, the WiFi can be turned on. The advantage of this is that you will not have any calls or SMS since the mobile network is shut down but you will be able to run the Internet. Even though Airplane mode is turned on, you can turn on Bluetooth in mobile so that you can enjoy music and songs by wireless connectivity. Hope you liked this article in which we got to know about the airplane/flight mode. If you have any questions related to this, ask in the comment box. How to Run Two WhatsApp Accounts on Your Computer or PC? What is Key Feature of BHIM UPI 2.0? This is one of the best Blog for free Tips and Tricks tutorials about Blogging, SEO, YouTube and Computer which can be very very helpful for your daily life. Share and Comment My Posts, Stay tuned in this Blog for further updates.